With the device powered off, press and hold the Power button until the moto logo appears then release. 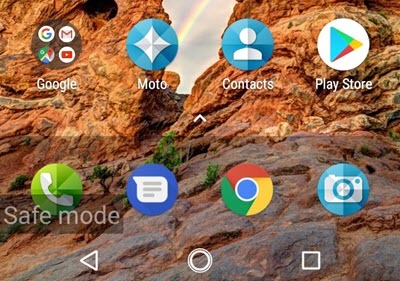 Approximately 2-3 seconds after the moto logo appears on-screen, press and hold the Volume down button. If pressed too soon, it dpes not boot into safe mode. Continue to hold the Volume down button until "Safe mode" appears in the lower-left of the screen then release.